Toyota Australia engineers and Anglesea test track construction contractors took extensive measurements over two years to help replicate real world public road conditions at the new complex. Pot-holed, worn and loose surfaces are part of the Anglesea testing facility mix of road conditions designed to duplicate real world environments experienced throughout Australia. Toyota's new Dohertys Road Parts Centre at its Altona manufaturing complex in Melbourne. Recessed and raised manhole covers set in cast concrete at Anglesea replicate typical urban motoring conditions experienced by Toyota drivers around Australia. Steering feel, general ride comfort, ride compliance are all put under the microscope at Toyota's Anglesea test facility. 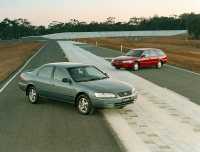 A 100 metre section of test track at Anglesea replicates worn bluestone paving typical of road conditions found in parts of suburban Melbourne.